We’ve posted a few excerpts of the findings. A complete report will be published in the Fall 2018 issue of "Inter Nos." The NATS Education Commission, appointed by the NATS Board of Directors in 2013, conducted a formal written survey in May 2017 to determine the depth of interest and involvement of the NATS membership in all phases of music education of children in kindergarten through grade twelve. We thank the many NATS members for their participation and appreciate their contributions. Below are a few excerpts the findings. A complete report will be published in the Fall 2018 issue of Inter Nos. NATS members recognize the importance of the K-12 years in laying a strong foundation for singing. Even among those not actively teaching at that level, more than 40% of respondents rated themselves somewhat or very interested in K-12 music, with just over 17% somewhat or completely uninterested. Additionally, almost two-thirds of respondents (65.7%) consider ages 10 to 15 as the optimum window for beginning individual voice study, with only 13.9% recommending waiting until age 16 or above. However, nearly half the respondents (49.7%) felt their formal training did not prepare them well to work with children’s voices. This disconnect between the perceived importance of singing education at the K-12 level and voice teachers’ lack of confidence in developing young voices is a call to action for university voice pedagogy instructors. It is essential that they gain knowledge of the special characteristics of the child and adolescent voice. They must not simply “teach as they were taught”; if they didn’t gain this knowledge in their own university study, they need to engage in continuing education to create a more complete course for their students. Considering the research available about the benefits of early exposure to and experience of the arts and the high percentage of respondents aware of this topic, the lack of attention given in our current system of education to preparing voice educators to work with children is surprising. While 73.9% of respondents reported working with middle or high school children, 49.7% felt unprepared to work with children’s voices. This is a definitive hole in education. Respondents reported seeking education from non-university programs, consulting mentors, and trial and error and the like. More attention to this topic is needed. “After reviewing the findings of the May 2017 Education Commission Membership Survey, I have come to the conclusion that the music education profession has become a “fountain of youth!” This is found in both areas of K-12 music education and University and College teaching. 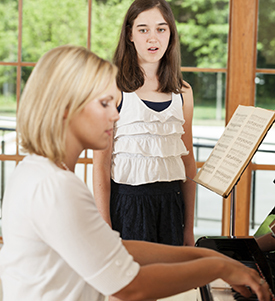 Our K – 12 music educators are in the early years of their career. Of the 299 viable responses, 183 (61%) of the K-12 teachers have 1 – 5 years of teaching experience. 61% of K – 12 teachers have 1 – 5 years teaching experience. The second largest group was the 6 – 10 years teaching experience with 13% (40).